In April, almost 50 research students and Post-Doctoral Research Assistants, who are working on a unique nuclear decommissioning programme, gathered in Bristol to share their progress and exchange ideas with representatives from industry, regulators and international organisations. 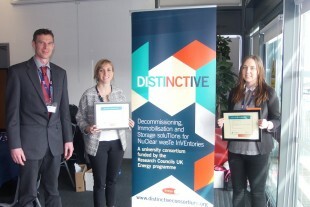 The Bristol event enabled everyone involved to share their research results with other members of the consortium and the wider nuclear decommissioning supply chain. The students designed posters for the event and gave a series of presentations. The industry representatives voted for the winners and I was privileged to award the prizes. My congratulations go to PhD students Claudia Gasparrini and Sophie Rennie who collected awards for their top-quality contributions. Claudia’s oral presentation outlined her work on the immobilisation of carbide fuels with potential application to legacy material from Dounreay, while Sophie’s poster focused on the effect of radiation on the dissolution of uranium, which might influence strategic decision-making for both interim storage and final disposal. The fantastic 4-year nuclear programme is called DISTINCTIVE, otherwise known as Decommissioning, Immobilisation and Storage Solutions for Nuclear Waste Inventories - though this tongue-twister is rarely used. We are funding this work along with the Engineering and Physical Research Council, Sellafield Ltd and the National Nuclear Laboratory. The in-kind and direct financial support that we provide to the DISTINCTIVE programme supports one of our key R&D objectives of maintaining the key skills and capability required to carry out the NDA’s mission. DISTINCTIVE was launched 2 years ago to help develop our next generation of nuclear experts, and, critically, to encourage greater collaboration between multi-disciplinary university research projects and industry. The National Nuclear Laboratory (NNL), NDA and Sellafield Limited collaborated with the Engineering & Physical Sciences Research Council (EPSRC) to initiate the £multi-million programme, which was launched in 2014. The collaboration with EPSRC enables NDA and Sellafield Ltd to leverage their funding and also support for the scheme, through the provision of in-kind assistance such as technical supervision or access to facilities. DISTINCTIVE follows the success of a similar 4-year programme, known as DIAMOND (from decommissioning, immobilisation and management of nuclear wastes for disposal) that concluded in 2013. Our industry derives major benefits from academic research that is targeted specifically at some of the challenges we face with our nuclear legacy. The quality of DISTINCTIVE’s work is impressive and the collaboration works extremely well. I’m now keen to see how these projects, which are now at the half-way stage, work out. It is hugely important that the students understand the context for their work and how it could be applied on the ground. We look forward to seeing their expertise develop and hope their skills will contribute to decommissioning progress in the years ahead. The National Nuclear Laboratory will issue a PhD call for proposals on behalf of the Nuclear Decommissioning Authority later this year. Funding will be available to UK academic institutions for PhD projects and to SMEs seeking ‘top-up’ funding for CASE awards and EngDocs in relevant areas. Love the way to write. Good stuff.